Earlier I made a dismissive remark about Marco Rubio to the extent that I was having a difficult time imagining him as the GOP presidential nomininee. 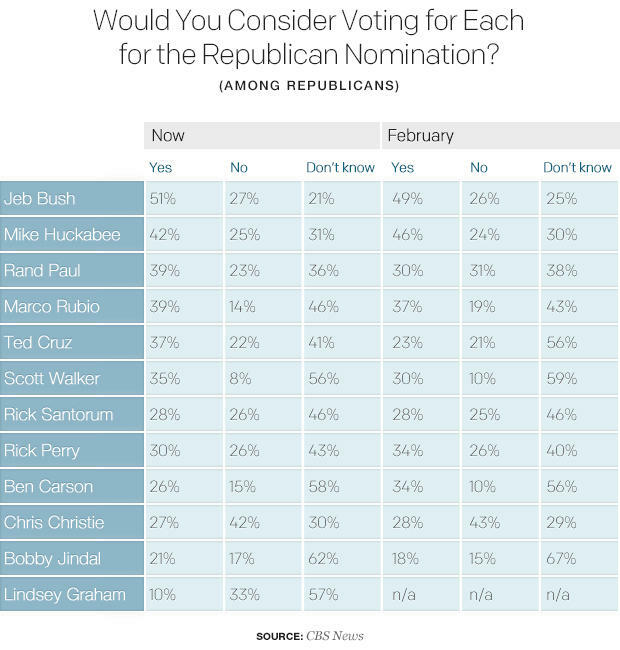 Instead, I think Jeb Bush the most likely winner although believe Scott Walker could have potential. Sure, after Rubio's recent announcement that he would run, he got a polling bump but, according to Enten, that's not the point. The point is that Rubio is "well-liked across the party apparatus. He pulls in conservatives with his voting record and moderates with his impressive 2010 Senate victory in Florida, a crucial battleground state." This is all evident in non-horse-race polling. Rubio’s net favorability rating among Republicans is near the top of the field. The gap between Republicans who could see themselves voting for Rubio and those who couldn’t is among the field’s best, according to an average of CBS News surveys conducted this year. According to all of this, and despite what my gut tells me, Rubio may well "be in a good position to win over Republicans who are currently undecided or tentatively supporting another candidate." Of course even Enten wants to hedge, as he quickly adds that Rubio may not actually win voters over but "he’ll just be in a good position to." Still, he concludes that "few other candidates look as strong in the underlying data that will ultimately dictate the direction that the 2016 Republican primary takes." So, why can't I take Rubio seriously? For starters, he looks too much like a boys scout or class valedictorian and seems way too prone to want to please, which may help explain his flip-flop on immigration. Or maybe my reason for not taking him seriously is a matter of age. I'm too old.